32 print 6″ x 6″ squares, and 32 white 6″ x 6″ squares (approx. 1 yard cut into 5 strips 6″ x the fabric width, then subcut 7 squares from each strip). For this particular quilt I used about 8 different print fabrics, and cut 4 squares from each fabric. 2. Pin a print square and a white square right sides together with the pencil line facing up. 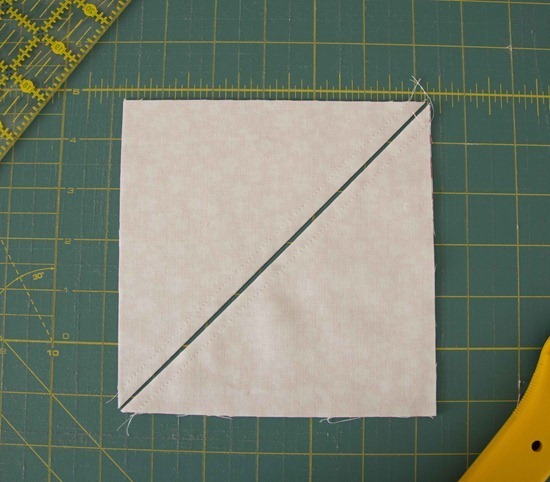 Sew 1/4″ from the line on each side ( I usually don’t pin these squares…but you should…I’m just lazy). Continue until all of the 32 print and white squares have been sewn together. To make this process faster you can chain piece all of the squares. Sew on one side of the line on all of the squares, then without cutting the threads in between the blocks put them back through the machine and sew down the other side. Then when you’re all finished clip both threads in between each block. 4. Cut another diagonal line from the other corner to corner on the same square. 6. 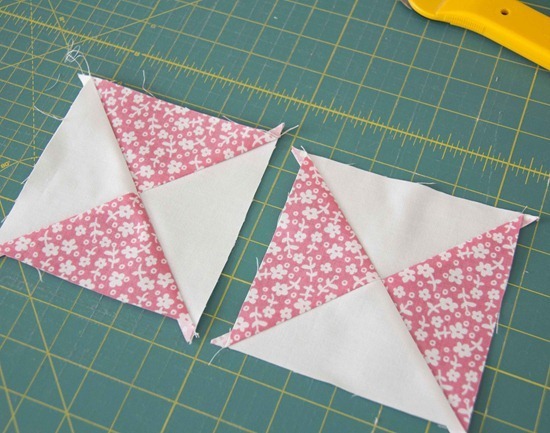 Match and pin the center seams, then sew the pieces together to make 2 hourglass blocks. Press seam to either side or open. Measure from the center 2 1/2″ out on one side, and trim off the excess. Do the same on the top or bottom, then you can align the edges along the grid lines and trim the remaining edges to make a 5″ block. If your mat doesn’t have these handy grid lines you’ll have to find another way, but simply measuring 2 1/2″ out from the center on each side should be fine. You can even cut more than one at a time if you’re not a perfectionist. 8. Lay the blocks out in 9 rows of 7 blocks each, rotating every other block. Sew the blocks into rows, and press the seams towards the print fabrics (that part is important so you’re seams will match up nice and tidy when sewing the rows together). Pin and sew the rows together to finish the quilt top. Apparently it’s 5 year old boy torture to make him hold up a pink quilt…heaven forbid…you should have heard the grumbling. 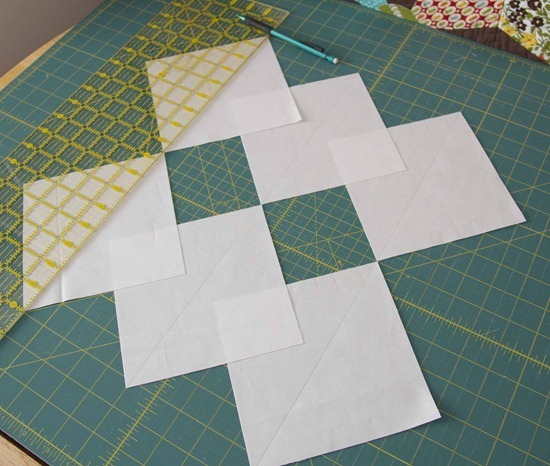 *To make hourglass blocks in any size… cut your starting squares 1″ larger than you’d like the (un) finished squares to be. * The fabrics in this quilt are Daisy Cottage by Bee in my Bonnet Designs for Riley Blake (here, here, here, here, and here), and the bright pink small floral and polka dot are Children at Play by Sarah Jane for Michael Miller. Beautiful quilt! Love the fabrics you used! 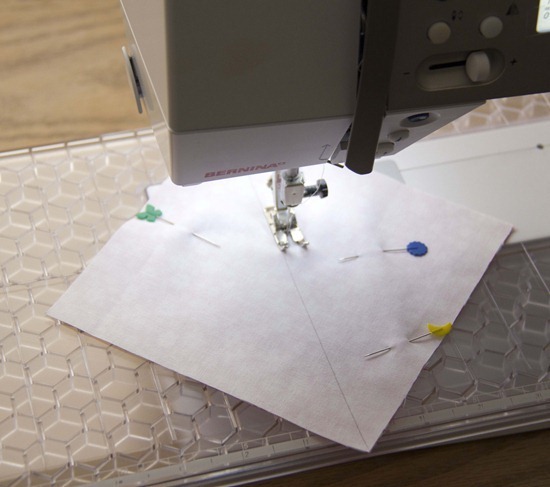 I am so in awe of accomplished quilters – getting all the corners to line up has always been a point of frustration with me. Great tutorial! Thanks for sharing. Lovely quilt & thank you for the tutorial. Thanks for the wonderful tutorial! 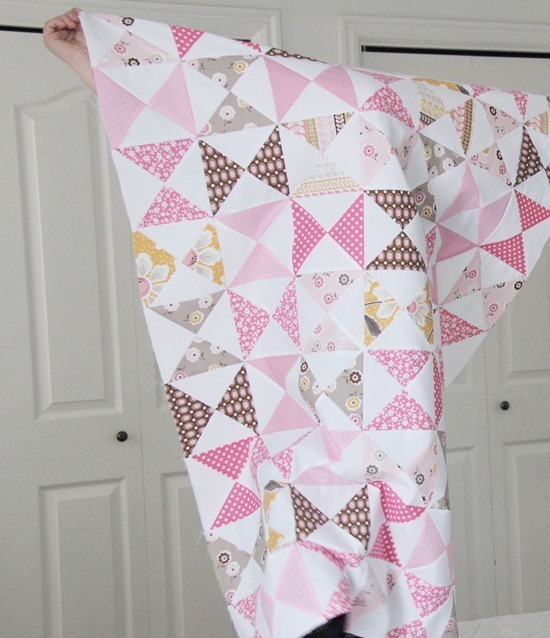 I've been looking for a sweet quilt to make for my baby quilt, and I think I've found it! oh so pretty! your quilt top is just perfect for your upcoming gal! This is such a beautiful quilt. Love the pinks! 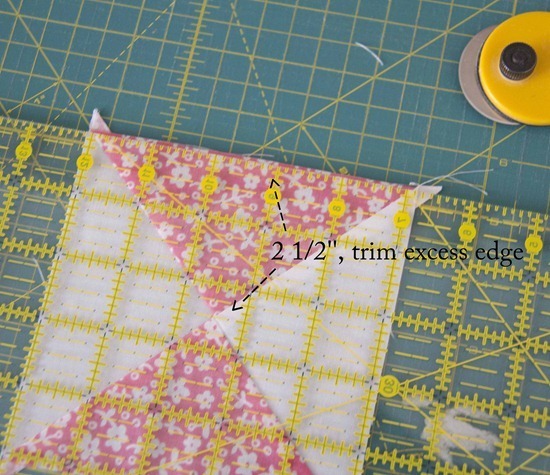 Very sweet little quilt and a perfect tutorial. That is so pretty! I think it might be the simplicity that appeals to me. So pretty! That is one of my favorite blocks too. Completely adorable!!! Love all the pink! Beautiful – lucky little girl to be. so lovely! great fabrics and pattern. thanks for the tutorial – not as hard as I thought it would be! I never realized there was such a simple way to make that block! Thanks for the quick tute! Cute blanket! and thank you for the tutorial… it's fun to learn a new process! LOVE the top. The colours are amazing! Thanks for the tutorial….maybe I'll just make one of these…. That quilt is just too sweet!! I want one!! Simple and classic, but no less lovely! Awesome tip on squaring. Thanks! Beautiful! I love what you did and thanks for sharing your tips! ohhh.. this is so.. AMAZING!!!! I think it is very sweet, good job. I did have to smile at the picture of your son. What a cutie pie. Poor thing, holding a pink quilt. He'll never live this down. He sure is cute though, in spite of his misery! I love it! Classic and so very cute! Sweet…such a lovely quilt for a little girl! Pink Perfection! I'm still trying to master "squaring up," I made some Half Rectangles and I had to rest my brain for a day after. They still didn't turn out right! When are you due, again? My sister had a baby yesterday- on Leap Day! That quilt top is lovely. Pretty but not too "precious". Love it. Very pretty! Thanks for sharing! Sweet quilt and thanks for the tutorial! I think I will make one like this. So lovely. It's truly lovely. Looks and sounds like it was made with love. :) There's just something great about "pink"! Please tell him thank you! It is a great quilt and I haven't made that pattern before. Thank you much and hope you are feeling ok these days. It will change your life I promise!! Thanks for the tutorial and a great finished result! Very nice quilt – love the colors. Good thing pink has always been my fav color – we have four daughters!!! Love it! What a nice fresh looking quilt. 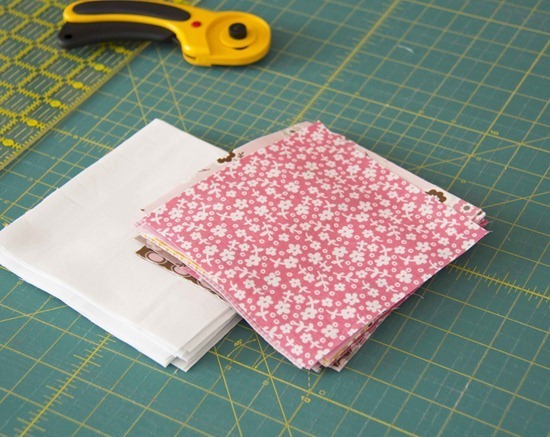 This would be great to use some fabrics up from your stash. So pretty and sweet! Love your fabric choices! That is just fresh and yummy in those fabrics! 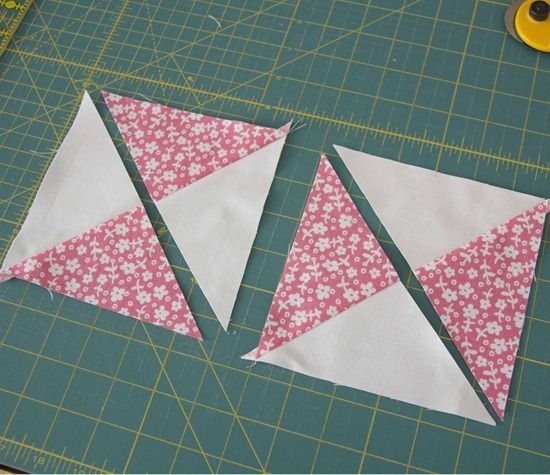 I CANNOT WAIT to make a cute hourglass baby quilt…Thanks for the tutorial. VERY helpful! What an adorable helper you have, such bright blue eyes, love the quilt I'm starting one for a family member who has a little girl this will be perfect. Beautiful! Great tute! Definitely going on my list. Thank you! I love a classic block…perfect for the baby! It's gorgeous! I love classic blocks like these. I'm actually making an hourglass quilt, I started in the summer, eek! So it's good to see some beautiful inspiration. 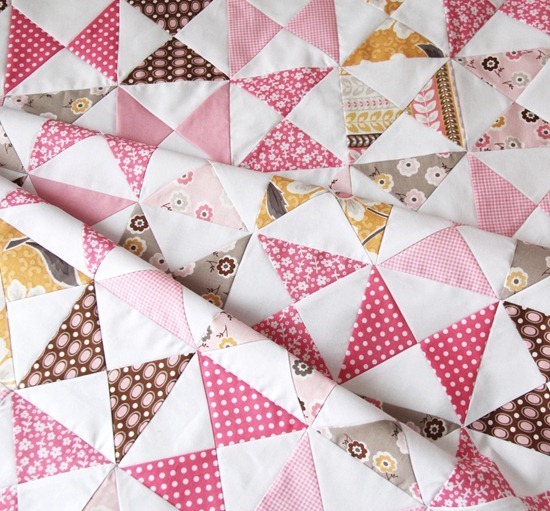 I really love classic blocks in modern fabrics, and who can resist such a fresh, girly baby quilt? It's so pretty. Congratulations on your new little one. Adorable! Thank you for sharing! ABSOLUTELY GORGEOUS!! love that, great job! Thanks for the tut! I'm passing it along to some quilting friends (snowbirds) in Florida. They will LOVE it! 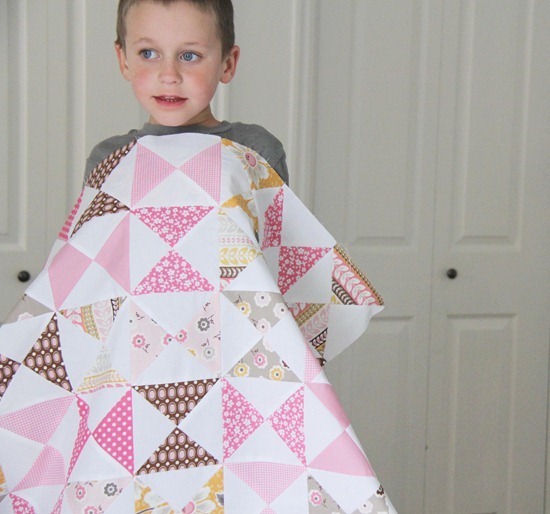 Beautiful quilt – handsome little boy!! Lovely! And I enjoy your awesome tutorials! Thank you for the tutorial. You make it sound so very easy. would love to see how you ended up quilting this. This is so sweet!! Thank you for sharing!! Just math checking — you started with a 6" square and ended with a 5" unfinished square, right? That yields a 4.5" finished square to my way of thinking when the seam allowance is taken into account. 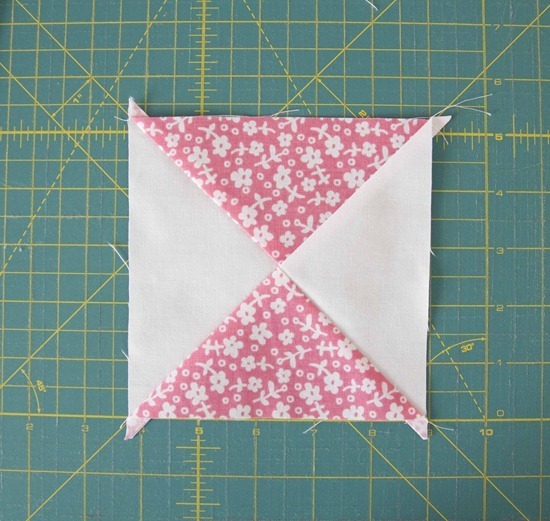 The end of the tutorial says to add 1" to your finished block size to determine the size of your starting square. I'm thinking it ought to be 1.5" to account for the seam allowances. Or would that just leave a larger margin for error when it comes to squaring things up? Beautiful quilt and an excellent tutorial. Gorgeous! I love the tutorial, and adore your little helper. I have two boys who are anti-pink as well. Too funny! Thanks for the inspiration, I love your pink and white hourglass quilt. I could hardly wait to start one and have dug into my scraps. So simple and pretty. wow! i like colours & fabrics. Thanks for posting these instructions! I used the same technique, but sewed the triangles together to make a chevron pattern. It turned out so cute! Thanks! What a beautiful quilt !.. I wish you will visit my new blog and you could see the quilt I made thanks to your tutorial …. thanks so much for this tutorial…I loved it! I followed it strictly to make one for our family. I'm putting a post up today about it. I've linked to your blog…thanks again. I appreciate all the time and effort you put into this tutorial. A Great tutorial Thanks so much. Have a bunch of 1930's kiddie novelty feedsack prints that would love this application. It will showcase their 'stories' and I can't wait to start. I love the tutorial for the hourglass quilt. Your quilt is beautiful. I like the white mixed with the prints. 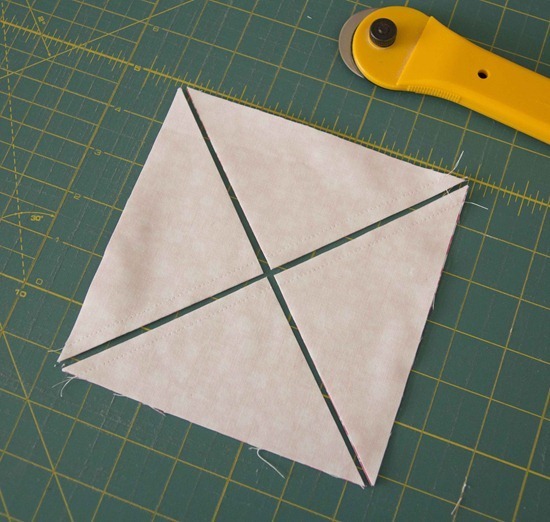 If you want to avoid sewing triangles completely only make one diagonal cut. 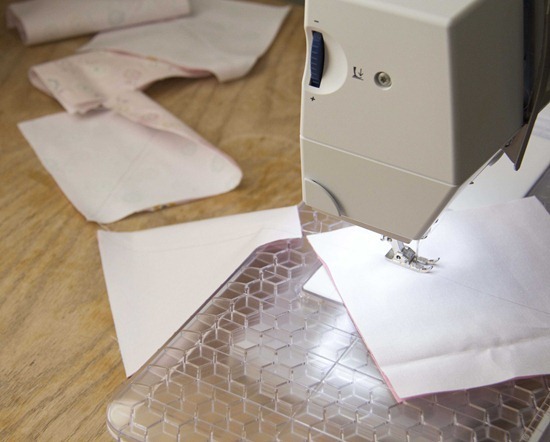 Then iron them open, mark your line on one of then again, put them RST with one square rotated 90 degrees and sew on both sides of the line, cut between and presto 2 hourglass blocks. I think jenny doan did it this way if I haven't explained it well. Thanks for your fabulous blog. So sweet…and what a wonderful tutorial – thank you Allison! I made this quilt this weekend and it took me 7 hours from start to finish-thank you for the great tutorial! It was an easy quilt to make and it turned out beautiful just in time for the baby shower. Thank you ! I’ve just finished piecing all of the blocks in bright, primary colors, because it’s a boy!!! My niece just adopted a tiny baby boy, and I can’t wait to snuggle him in this beautiful quilt!!! Thank you for the great tutorial! Just finished mine! Thanks for the beautiful photos and helpful tutorial! Beautiful! Thank you for sharing your talents! This is a charming quilt. Thank you for the tutorial. Had to comment re boys and the horror of them touching pink. I’ve never ever understood this one and mine are the same way. If women carried on about blue the way men and boys do about pink, WE would be labeled ridiculous, hysterical etc and they would not be wrong. Thank you, thank you, thank you! I used this to make my very first quilt top. After all that work, I didn’t trust myself to quilt it, so I took it to a local quilt shop where they are doing the actual “quilting”…I pick it up tomorrow. I can. not. wait. to see how it turned out! How exciting! I hope it turned out lovely!!! I really can’t wait to make this quilt for my new great granddaughter. I don’t see a video. Or by tutorial do you mean the pictures? I’d love to see a video. Yep I just mean pictures, sorry! What a cute idea! I’m in the process of making 170 Christmas pillowcases to donate to a senior facility and this would make a lovely quilt to use up the left overs. Beautiful baby Quilt. 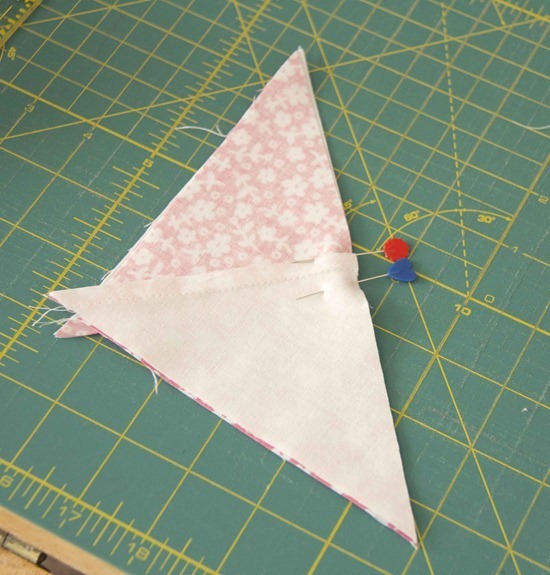 I’m in the process of making a Pinwheel Quilt. love the pink. I’ve noticed allot of Grey used in Baby Quilts which surprised me because I would never have thought to use Grey. But they also look beautiful. Great job and thanks for sharing. 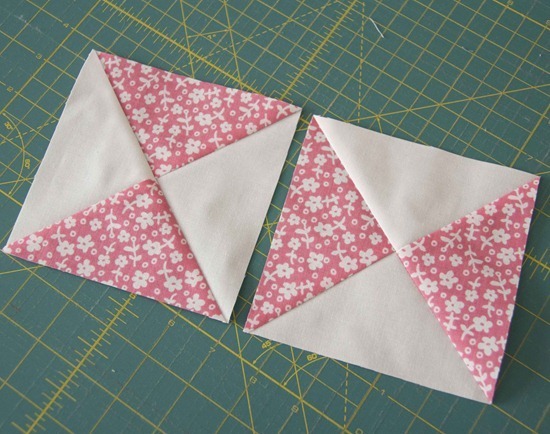 I’m having some trouble…I’ve cut the square twice diagonally …but I don’t know how to line them up to sew them all together so that they are one piece. love the quilt pattern. making a 4 baby quilts. thanks for posting. I have loved this quilt since you made it. I will finally be making it for a special lady and her soon coming baby. I’m using Howdy in all the girl colors! I will share it when I get it done. Shimmer will be done when I have time!